UNION LAKE, Mich. – (November 21, 2018) – Lindenwood University retains the top spot in the 2018-2019 American Collegiate Hockey Association Men's Division-I Ranking, No. 8. The Lions were pushed to the limit on the road at Bird Arena in Athens, Ohio, but escaped with a pair of conference wins over No. 4 Ohio University to improve to a perfect 16-0-0 on the season. 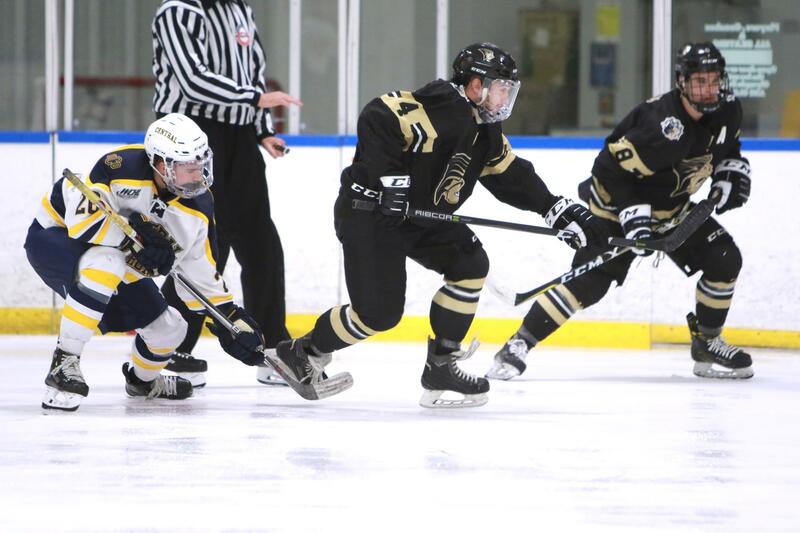 On Friday, Jake Townsend netted the game winner in overtime for the 4-3 Lindenwood triumph while Cooper Seedott stopped all 20 shots on Saturday for the 3-0 shutout victory as the Lions vaunted power play went 3 for the 7 with the man advantage. The University of Michigan-Dearborn (7-0-0) solidified its hold on the No. 2 spot and traveled all the way to Long Island, N.Y., to sweep Stony Brook University. Forward Tyler Groat paced the way with 2 goals including the game-winner during Saturday’s 4-1 win while goaltender Thomas Proudlock was the difference on Sunday with 33 saves, allowing the Wolverines to come from behind in the 3rd period with 3 goals and escape from New York with a 4-2 victory. No. 3 Adrian College swept a pair of home and home conference games with Eastern Michigan to advance to 13-0-0 on the season. Joe Costello, Rainer Glimpel, and Brenden Stanko paced the way on Thursday with a goal and 2 assists each as the Bulldogs goose egged the Eagles 8-0. Costello (2 goals, 2 assists) and Stanko (1 goal, 2 assists) were back at it on Friday night as the Bulldogs pumped 55 shots on Eagles goaltender Daniel Collins during their 5-2 win. Rounding out the top 5 was Iowa State University (10-4-0) as the Cyclones split a pair of games with No. 18 Robert Morris University Illinois. On Friday, Tony Uglem potted 2 goals and Nicholas Rogers dished out 3 helpers as Iowa State won 3-2. Saturday, however, the Eagles returned the favor as goaltender Cole Semchak bageled the Cyclones with 33 saves on the night. Moving into the polls this week is No. 25 Arizona State University, while Illinois State University drops out of the Top 25. The Central States Collegiate Hockey League leads the way with all five of its member teams ranked, while the Western Collegiate Hockey League has seven (of 8) of its member teams ranked, the Eastern States Collegiate Hockey League has four (of 6) of its member teams ranked, and the Great Lakes Collegiate Hockey League has four (of 8) of its member teams ranked. Over the past 16 seasons, 12 different schools have won the ACHA Men's Division-I National Championship: Lindenwood (3), Central Oklahoma (2), Illinois (2), Adrian, Arizona State, Davenport, Delaware, Minot State, Oakland, Ohio, Penn State, and Rhode Island. A total of 60 teams are competing in Men’s Division-I this season, including two new teams: the University of Toledo and William Paterson University. The two teams that have departed Men’s Division-I include Midland University and Saint Bonaventure University. The ninth ranking of the regular season will be released on Wednesday, December 5, 2018. The 2019 ACHA Men's Division-I National Championships will be hosted March 21-26 for the first time by the Dallas Sports Commission, Dallas Stars, and StarCenters at the Dr Pepper Arena, in Frisco, TX. This will be the eighth year of the 20-team format.